There are two items for sale, proceeds of which are used to benefit WAFHS' educational funds. These two items (the The Song of the Selkie CD and The Finale Book) are described below. The WAFHS has published a collection of the Finale music from the first 10 annual benefit concerts. 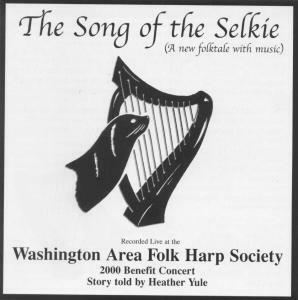 This popular collection contains 46 tunes, arranged for solo harp or multiple harps. Many of the arrangements include accompaniment parts. The book costs $15, plus any shipping costs. You may purchase the book through Melody Music or by contacting David Crookston. Song of the Selkie artwork by Jennifer Yust. Finale! Book artwork by Susan Harriet Baker.